$19.95 Out of stock. Email me when new stock arrives. Breakaway Props. They’re guaranteed laugh-getters—especially in a kids show. If you’ve ever performed for kids, you’ve probably included one. The Breakaway Wand and Fan are classics. So is the Clatter Box. 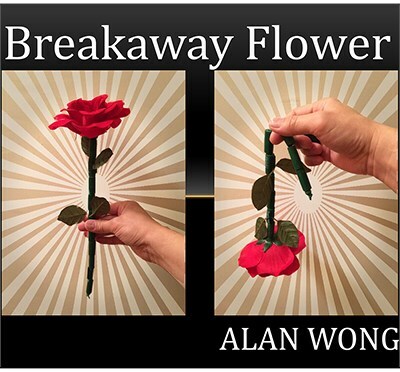 And now, you can own and perform The Breakaway Flower—a 12-inch long-stem rose that falls apart the moment a spectator holds it. You can take it back from the child, blow on it and it will restore itself back to life as it stands upright in your hand. You can even put it into a vase. The flower stem is made of custom cut wooden pieces. You get an extra gimmicked piece to lock the rose in the straight position so you can put it in a vase or bottle. At AmazeKids, we highly recommend including this in a routine in which you use a series of Breakaway Props so you can get those all-important escalating laughs. Add The Breakaway Flower to your kids show and watch your show grow!